Faith leaders from around Minnesota, including Archbishop Bernard Hebda, voiced concerns Jan. 30 about President Donald Trump’s recent ban on immigration from seven different countries. [Catholic Spirit] Trump [That's God Emperor to you.] signed an executive order called “Protecting the Nation from Foreign Terrorist Entry in to the United States” Jan. 27. It included a ban on immigrants from Yemen, Iraq, Libya, Somalia, Syria, Iran and Sudan due to perceived security threats by the U.S. government. Archbishop Hebda joined 11 other Christian, Jewish and Muslim faith leaders at the Jan. 30 press conference to call for lifting the ban. Speaking at Hennepin Avenue United Methodist Church in Minneapolis, the leaders said that God calls all nations to welcome refugees and immigrants. They don't read St. Thomas Aquinas any more. (Rome) This photoshop has been in circulation for some time, but we have refrained from publishing it because it could have been dismissed as cheap and disrespectful propaganda. Meanwhile, however, it has been released, entirely above suspicion, namely, on Vatican Radio where it is apparently considered funny and good. 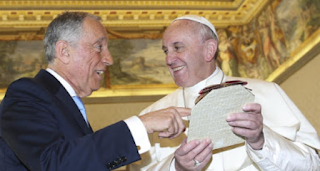 Vatican Radio is one of the official media organs of the Pope. Listeners and readers in Italy were amazed just a month ago just what was happening on the German site of Vatican Radio, but is only now becoming widely available. "Also a nice variant. We wish you a restful Sunday." Who is the Pope laughing at? About the "Reformation" or the Catholic Church? A bad joke? A malicious photoshop? A joke? A bad joke? A malicious photoshop to discredit Pope Francis? Not at all. Pope Luther or Protestant Bergoglio? What does Vatican Radio mean? 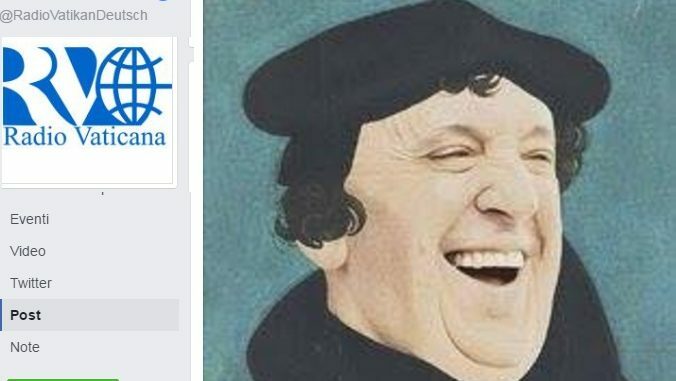 The weekly,Die Zeit had published the photoshop with the caption published on 4 November: "That Pope Francis considers Luther positively is well known. But is it right?" It was part of the coverage of the Reformation memorandum on 31 October in Lund, Sweden, where Pope Francis had participated. We of Katholisches.info had seen the photoshop on other sites, but did not post it out of respect for the Pope, because it seemed to us as if it it would be perceived as a critique of Francis and could have been dismissed as cheap polemics. That's what we thought. The editors of the German section of Vatican Radio thinks as quite differently and thinks only too well of it. 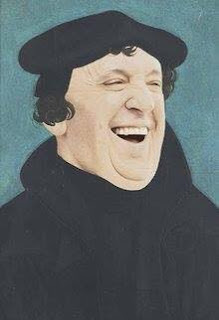 It is likely that the idea that Francis is the Luther of the 21st century was even considered humorous. 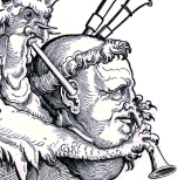 At any rate one knows how some of his German party see the reigning pope. Some commentators on the Facebook site were enthusiastic: "A brilliant photoshop. Significant and courageous for further Lutheran-Catholic dialogue." Others expressed their resentment, including those who considered the picture to be "striking," but for the precarious state in which the Church was in the German-speaking world. The German section of Vatican Radio seems to have so arrived in the pleasure society. The concept was already old in the 90s, but it is said that there is a certain "retardation" in Rome. In the German editorial office of Radio Vatikan, they are also pleased to see that in Austria the former party chairman of the Greens and former KPÖ voters, the atheist who had become a freemason in 1975, abortion, homosexual and immigration advocate, Alexander Van der Bellen, Was elected! Was that too polemical? Oh no. Given the "humor" of the German section of Vatican Radio certainly not. "Pope Francis is a Reformer Like Martin Luther" -- Margo Käßmann in "Osservatore Romano"
Edit: Käßmann is the first female Lutheran Bishop who was arrested for drunk driving in 2010, yet never the less, appears frequently to promote gender ideology, contraception and heresy at events staged in the fabulously wealthy German Catholic Tax-Church. 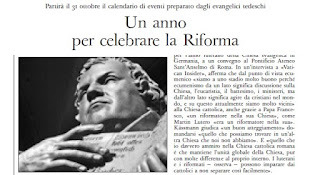 (Rome) German Catholic media started ​​it, the Osservatore Romano now follows, and is "celebrating" the commemoration of the Protestant Reformation with pleasantries. 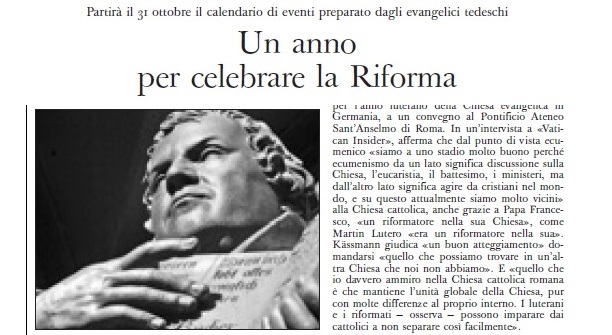 On May 7, the daily newspaper of the Pope published the article "A Year to Celebrate the Reformation". From October 31 2016 to the October 31, 2017 "the German Evangelical Church has" a calendar full of events. "The 500-year celebration of the Protestant Reformation will last exactly one year, which is traditionally associated with the publication of the Disputatio per declaratione virtutis Indulgentiarum which was in conjunction with the 95 theses, which Martin Luther nailed at the door of the episcopal church of Wittenberg in Saxony-Anhalt on 31 October 1517," said Osservatore Romano . The kickoff on October 31, 2016 will be a "great ceremony in the Marienkirche of Berlin". In May 2017 the "World Exhibition" in Wittenberg will take place, where "the products derived from the Reformation in the various countries and churches, but also the fruits of culture and civil society," will be showcased. The Kirchentag will be held from May 24-28. A Kirchentag "in motion", which will be held in eight German cities, and then all will merge in Wittenberg for its completion. "The German Evangelical Church has been preparing for this anniversary beginning in 2008 with a way of contemplating and to set up a network between 69 cities of the Reformation in Germany and in Europe, important places for the history and the presence of Protestantism. The conclusion of the festivities will take place at the national and international level on 31 October 2017 with a number of public events. The calendar of the ecumenical events is rich," said the Vatican daily. Ecumenism is "in a very good state, thanks to Pope Francis"
"We can 2017 make a critical revision daring to see the reformation on an international and ecumenical horizon as a complex factor," said the "theologian and Lutheran Bishop Margot Käßmann, Ambassador of Luther Year" recently held at a Catholic-Lutheran Reformation Conference at Pontifical Athenaeum Sant'Anselmo in Rome. "We are in a very good stage because ecumenism on the one hand is a discussion about what the Church, the Eucharist, baptism, officials, means, but then also acting as Christians in the world, and since we are currently [the Catholic Church] very close, thanks to Pope Francis, a reformer in his Church, as Martin Luther a reformer was in his." For Käßmann, said Osservatore Romano, it was "a good opportunity" to ask, "what we can find in his other church, which we did not." As a specific example she cited: "What I really admire about the Roman Catholic Church is that it preserves the global unity of the Church, despite the many internal differences." Bishop Voderholzer: "We have in Benedict XVI. a Pope, Whom Even Martin Luther Could Not Better Have Imagined." Edit: one commenter laconically writes, "We have a Pope named Benedict XVI..."
Voderholzer said afterwards in sermon in St Peter: "We have in Benedict XVI. a Pope, whom even Martin Luther could not have better imagined." Regensburg (kath.net/KNA/red) A delegation of the diocese Regensburg has met Emeritus Benedict XVI. in Rome. The occasion was a pilgrimage to Rome for the Year of Mercy, as the diocese announced in Regensburg on Monday. Bishop Rudolf Voderholzer handed Benedict XVI. a pilgrim scarf (photo available). The former Pope had folded this immediately and gave the pilgrims from home his warmest regards. Each participant got a photo with dedication. 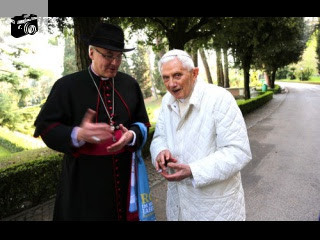 In a sermon in St Peter, Voderholzer honored Benedict XVI before the pilgrims as well: "We have in Benedict XVI. a Pope, whom even Martin Luther could not have better imagined. A pope who sees it as one of his first tasks, with all the powers of reason and historical knowledge, to give a testimony about Jesus Christ. 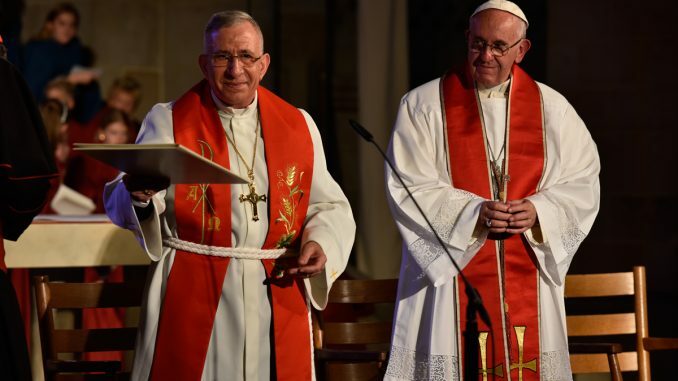 He has as much recognition around the world found as the theologian Pope, whose legacy we treasure in a qualified way, in Regensburg, that we may preserve and carry it into the future." Edit: looks like a reference to the Regensburg Speech, which Voderholzer probably didn't appreciate. 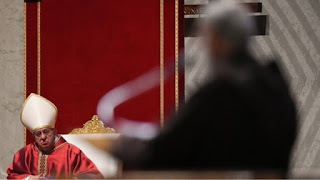 Praise for Martin Luther at St. Peter's Basilica: "Martin Luther HadBrought the Truth to Light Again"
(Rome) The Good Friday sermon in St. Peter's Basilica, was also given in the presence of Pope Francis in 2016 by the Pontifical House Preacher, Father Raniero Cantalamessa OFM Cap. The famous Capuchin declared some things that are very surprising to Catholic Christians. That Martin Luther's "merit " is "to have brought to light" again the "truth" about the "righteousness of God". The Catholic Church had "for centuries" "lost" a truth before Luther? But all of this means nothing if one does not first understand what the term "righteousness of God" actually means. When you hear talk of the righteousness of God and misunderstand this, then there is a risk to be put off by it, rather than feel encouraged. Augustine had already pointed out: "The righteousness of God," he wrote, "is that we are justified by grace, just like the salvation of the Lord '(salus Domini) (Psalm 3.9) that is, God saves us "1) In other words, the righteousness of God is the act by which those people who believe in his son, are justified and made pleading to him. It is not a matter of making "justification" but "to making the righteous." 2013 Cantalamessa attempts to set aside the "partition" between "various Christian churches" and eliminate the "relic of rituals"
"[Zenit] We must do everything possible so that the Church may never look like that complicated and cluttered castle described by Kafka, and the message may come out of it as free and joyous as when the messenger began his run. We know what the impediments are that can restrain the messenger: dividing walls, starting with those that separate the various Christian churches from one another, the excess of bureaucracy, the residue of past ceremonials, laws and disputes, now only debris." The full text of the Good Friday sermon in 2016 was published by Zenit. The original sermon was posted on the video channel of Vatican Radio. Preaching Cantalamessas in length of 25 minutes starting at minute 51:30 and ends at 1:17:30. Prime Minister Rebelo is a founding member of the Social Democratic Party of Portugal (PSD), created in 1974, which is - is a Christian Democratic party - despite the name. The encounter with the Catholic Church leader lasted half an hour. Following this, President Rebelo told the press that he had invited Pope Francis for the 100th anniversary of the apparitions of Fatima in Portugal. "I have am issuing an official invitation to visit Portugal in May to mark the 100th anniversary of the apparitions of Fatima. It is an invitation to visit Portugal. It is not for me to decide what position the Holy Father favors, who receives many referrals." On May 13th, in the month named by President Rebelo, the first apparition took place in 1917. An official confirmation by the Vatican is not yet forthcoming, but it is certain that Pope Francis will visit next year Portugal and Fatima. In April and September 2015, Francis had expressed a wish to visit the Portuguese Marian shrine. Francis has already announced his participation on October 31st, 2016, his preference for the Catholic-Lutheran commemoration of 500 years of Protestant "Reformation" in Stockholm. It's a decision that has caused some grumbling in certain Catholic circles. In this context, it is noted from the Catholic side that Protestants may indeed celebrate in 2017, although the 500 years of "Reformation" for Catholics is another commemoration, namely the 100 years Fatima is of real significance. 100 years Fatima - 500 Years of "Reformation"
The Pope's visit to Portugal and Fatima in May 2017 would be intended, say observers, as "compensation" for the participation of Francis at Luther commemoration that gives the impression of a Catholic recognition of Luther. 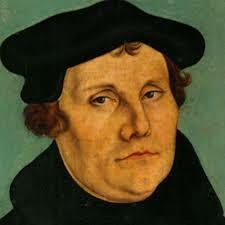 Martin Luther is synonymous with the most serious cleavage of Latin Christendom. "It is no cause to celebrate," said the Catholic News page Secretum meum mihi. On the question, what is important for Catholics in 2017, 500 years of Reformation or 100 years of Fatima, the Catholic news website: "We are pleased with the Blessed Virgin Mary, the Mother of all Christians, the true ecumenist, for she is truly Catholic." Rome (kath.net / idea ) The expectation that Pope Francis is to come to the 500-year anniversary of the Reformation in 2017 in Germany has been downplayed by the President of the Pontifical Council for Promoting Christian Unity, Cardinal Kurt Koch. The Pope had given no reply to the invitation of the Evangelical Lutheran Church of Germany Council Chairman, President i.R. Nikolaus Schneider (Berlin), said the Swiss Cardinal in an interview with Vatican Radio. 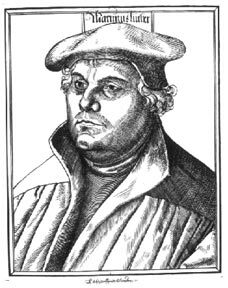 In a private audience on 8 April Schneider had invited the head of the Roman Catholic Church, to participate in Wittenberg in the events commemorating the theses of the reformer Martin Luther (1483-1546) 31 October 1517. The Vatican sees, among other things, no reason to “celebrate" the Reformation, its following schism and the religious wars of the 16th and 17th Centuries, but wishes only “recollect” it. The ELCG Council stressed that it was not the anniversary of the Reformation to go about celebrating "the birth of the Protestant church." Luther did not want to found a new church, but to reform the Catholic. It would also not hide the dark side of the Reformation and the Reformer. Rather, the anniversary should be designed as a Christian festival that every Christian can celebrate. Koch also pointed out to Vatican Radio different responsibilities. The Vatican is not the actual contact person for the ELCG, but the German Bishops' Conference. Lutheranism, by contrast, has a “worldwide presence," said Koch. The Vatican engages in theological conversations especially with the Lutheran World Federation (LWF). They had agreed together in the Joint Declaration on the Doctrine of Justification in1999. Koch himself took part last November while participating in the General Synod of the United Lutheran Church of Germany (VELKD) Timmendorfer Strand in Luebeck, but not at the subsequent ELCG Synod. The Lutheran Evangelical Church doesn’t understand itself as an autonomous church, but as a community of 20, United and Reformed churches. As Koch said in the current interview further in view of discussions between the Catholic and the Lutheran church, the competent International Commission has prepared a document to commemorate 2017th year of the Reformation. It is expressed in the English title "From Conflict to Communion" (From Conflict to Community). The paper is finished, but is to be released only after the German translation is complete. Worldwide, the Roman Catholic Church has about 1.2 billion members. The number of Lutherans is [merely] about 74 million, which includes nearly 71 million to the LWF member churches. Roberto de Mattei: Will Pope Francis Address the Causes of the Crisis? The Example of Hadrian VI. The History never repeats itself exactly the same in the past, but it helps to understand the present. In the 16th Century went through the Catholic Church a crisis that had never happened before. Humanism, with its immoral hedonism had infected the Roman Curia and the popes themselves. The corruption of Martin Luther's Protestant pseudo-reform had arisen, which Pope Leo X. who was from the family of the Medici, dismissed it as a "quarrel among monks." The heresy then immediately spread out, as after the death of Leo X. 1522, a German pope, Adrian of Utrecht, was unexpectedly chosen. He gave himself the name of Hadrian VI. The shortness of his pontificate, prevented him from bringing his projects to a conclusion. This is particularly true that, as well-known papal historian Ludwig von Pastor writes of the gigantic conflict against the many abuses which disfigured the Roman Curia, included almost the entire church. Even if his papacy had lasted longer, the evil was too deeply rooted in the Church, Pastor noted, than it would be necessary for a single pontificate to effect such a great change. All the evil that has been done for generations, could be overcome only by a long continuous work. Hadrian VI. realized the extent of the problem and the responsibility the men of the Church who bore it. It is clear from the Instructio that on the apostolic nuncio Francesco Chieregati read on behalf of the Pope third January 1523 at the Diet of Nuremberg. Ludwig von Pastor emphasizes the extreme importance of this document, to learn not only about the ideas of the Pope for the renewal of the Church, but because it is as a text, never been in Church history never before. After it initially rejects the Lutheran heresy, he treats the last and more important part of the instruction, the failure of the highest ecclesiastical authority against the revolutionaries. We frankly confess that God lets it happen this persecution of His Church, because of the sins of the people and especially the priests and prelates. It is certain that the hand of God has not withdrawn, not because He can not save us, but because our sin separates us from him and therefore He does not hear us. The Scripture clearly teaches that the sins of the people have their origin in the sins of the clergy and therefore, as St. John Chrysostom explains, our Saviour, when He tried to clean the sick city of Jerusalem, he first went to the temple to punish the sins of the first priest, like a good doctor who cures the disease at its source. We have never sought the papal dignity, and would much rather have closed our eyes in the retreat of private life: We have waived the tiara, and only the fear of God, the legality of the election and the danger of a schism have led us to the office of the highest pastors to assume that we do not want to exercise in ambition, nor to enrich our families, but only to return the Holy Church, the bride of God to Her original beauty, to help the oppressed, to promote wise and able men to absolutely everything to do, what befits a good shepherd and true successor of Peter. However, no one should be surprised if we do not remove at a stroke all the abuses, because the disease is advanced and deeply rooted. It will therefore be taking one step after another, and confront the dangerous evils by the right drug, not to hasty reform to confuse everything even more. For, as Aristotle says, any sudden change is dangerous to common life. The words of Adrian VI. help us to understand how the present crisis of the Church originated in doctrinal and moral defects of the men of the Church in the second half century since the Second Vatican Council. The Church is infallible. But Her members, the high ecclesiastical authorities, can make mistakes and must be willing to admit their guilt publicly. We know that. Adrian VI had the courage to tackle this critical examination of the past. How will the new pope counter the process of doctrinal and moral self-destruction of the Church and what position will he play against a modern world that is immersed in deep anti-Christian feeling? Only in the future will we be able to answer these questions, but it is certain that the cause of the darkness of our present time are in our recent past. The story also tells us that Hadrian VI. was followed with the name of Clement VII (1523-1534) Giulio de Medici. 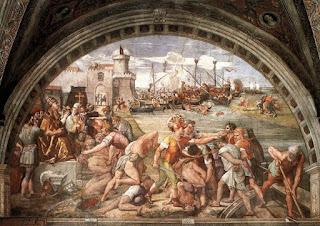 Under his pontificate, the terrible sack of Rome took place on 6 May 1527 by the Lutheran mercenaries of the Emperor Charles V. The destruction and sacrileges that were committed then, and those of the year, exceeded the sack 410, can be barely described. There was particular brutality taken against religious and clergy: nuns raped, priests and monks killed or sold as slaves, destroyed churches, palaces and buildings, relics scattered and taken away. After the carnage famine and pestilence followed in quick succession. The citizens were decimated. The Catholic people interpreted the event as a just punishment for their sins. Only after the terrible looting did life begin to fundamentally change. The climate of moral and religious relativism dissolved and in the general distress, a serious, sober and contrite air made throughout the holy city. This new atmosphere made the great religious revival of the Catholic Counter-Reformation of the 16th Century possible. "What concerns the German Bible, so every Lutheran should now know is that in Germany, German Bibles were had and read before Luther sprang and pitifully seduced and deceived our beloved fatherland with his villainous, prankish and interlaced Bible." The historical critic confirmed this harsh criticism. In 1522 Luther's German translation of the New Testament appeared in Wittenberg. Before this point in time there were 14 complete High German editions of the Bible available. At the same time Luther boasted that he "had pulled the Bible from under the bench". The Swiss Reformer Huldrych Zwingli (+1531) thought that such bragging should have been "flogged out". Luthers work showed itself soon to be unusually prone to error. Already the Elsatian schismatic Martin Butzer (+1551) found a large number of mistakes in Luther's translation. Other Protestants, like Christian Karl von Bunsen (+1860) explained that the meaning of the original did not match in a hundred places. No other was as mistaken about the original text. It was regarded as the most imprecise of all translations. Over 3,000 places needed correction. In 1885 a book appeared in Berlin with the following title: "God's food and the Lutheran Bible translation -- two fundamentally diverse things." Protestant yes men set themselves against any alteration out of exaggerated honor for Luther. The erroneous teaching of the justification of men through faith in Christ alone led Luther to counterfeits of Holy Scripture and the intentional falsification of the written word of God. His followers were led to only understand Holy Scripture as he misunderstood it. "Guard yourself", warned Luther, "against all the teaching which need aught but these words (Law, Sin, Grace, Faith, Justice in the Letters of Paul), be they who they will, even as if they were the same as Origin, Ambrose, Hironymus, Augustine and still higher." Through omissions, distortions, truncations, Luther gave Holy Scripture a Lutheran face, so that the Bible, at least from the great mass of superficial readers, vouch for him. In 2 Peter 1: 10 he simply removed for example in the sentence "Wherefore, brethren, labour the more, that by good works you may make sure your calling and election" the words "good works". The classical example of Lutheran written falsification is Romans 3:28. There, St. Paul wrote: For we account a man to be justified by faith, without the works of the law." Luther arbitrarily shoved the word "alone" out so that it meant: The man will be justified through faith alone without the works of the law." Why? So that the people believed that Luther taught the same as St. Paul. What would not be melded into his system, was thrown out, like the letters of James, the Hebrews and the Apocalypse of John. The book of Tobias as denoted as a comedy by Luther. The wasting of Job was explained with: "The Devil foisted some syphilis on him". In Sirach 3, 5 a church teacher is introduced as a jokester. "Everyone who goes with Moses, must go with the devil, to the gallows with Moses. The Ten Commandments don't apply to us Christians and the heathens, but the Jews alone." Or: "Pfui you there, pfui you there and where you are, you damn Jews! Are you worth nothing that you see the Bible from outside. Let alone that you read what's inside. You should only read the bible, which is under the pig's tail, and the letters fall out the same way, eat and drink. That would be a bible for such prophets." The Prophet of Wittenberg handled Holy Scripture and its author so disgracefully. Edit: Of course this is one of the scariest times of the year. There are recollections of one's mortality and the decay of things as the days grow colder, more bitter and remote. It is also the time when Martin Luther launched the Protestant Revolt. Halloween is made scarier still by the appearance of the reformer. 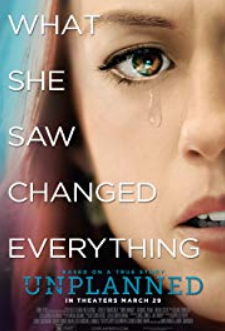 But the connection is more than merely temporal, for there are links between the Protestant Revolt and occultism which brings the modern age more clearly into focus. [Daily Mail] Halloween is largely a secular celebration which has its origins in an ancient festival marking the start of the 'darker half of the year'. Father Canals urged parents 'to be aware of this and try to direct the meaning of the feast towards wholesomeness and beauty rather than terror, fear and death'.